Science met art at this year’s holiday party as UNC Lineberger labs, departments and offices set out to win the Dr. Seuss-theme door decoration competition. 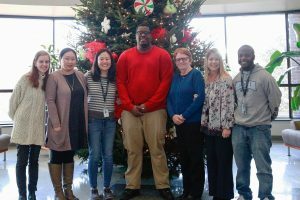 The members of the holiday party planning committee, from left to right, are Kaitlin Porter, Ning Fu, Jessica Platz, Tony Lindsey, Mary Lou Coffman, Ashley Belcher, and Jonathan Stroud. UNC Lineberger’s holiday party was just what the doctor ordered – Dr. Seuss, that is. Nearly two dozen Lineberger-affiliated departments, labs and offices competed in the contest for bragging rights and a free group lunch. David Darr, Wendy Sarratt, DrPH, and Dean Staley had the tough task of judging the competition, which required teams to decorate their doors using cancer awareness ribbons and Dr. Seuss characters. Creativity and whimsy were on display. A colorful poster in Marsico Hall featured the residents of “Marsicoville,” Blossom Damania’s lab created a clever ode to Cell-ville and its population of approximately 37 trillion, (“Every cell down in Cell-ville liked Christmas a lot, But the Cancer Grinch just north of Cell-ville did NOT!”) and a play on the Office of Genomic Research, which became the Seuss-themed “Office of Grinch Research” courtesy of Michele Hayward, RD, and Ashley Salazar. Keeping in the holiday spirit, faculty and staff were invited to donate a new, unwrapped gift for UNC Pediatric Hematology-Oncology Program patients. Thanks to the year’s party planning committee, Ashley Belcher, Mary Lou Coffman, Ning Fu, Tony Lindsey, Jessica Platz, Kaitlin Porter and Jonathan Stroud, who worked tirelessly to decorate the Lineberger atrium, arrange the buffet and organize the door decorating competition.